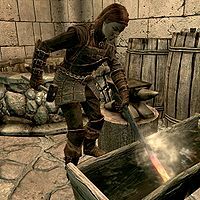 Sorine Jurard is a Breton thief added by the Dawnguard add-on. She is a former compatriot of Dawnguard leader Isran and he will ask you to find and recruit her during the quest A New Order. Once recruited, she will work out of Fort Dawnguard along with another old associate, Gunmar. The two newcomers will ask you to find reinforcements during the quest Bolstering the Ranks. Sorine specializes in the art of crafting crossbows, heavily influenced by the methods of the ancient Dwemer, and will task you with finding numerous schematics during the quest Ancient Technology. She is also a master trainer in Archery and sells general merchandise. She initially wears a set of leather armor with a matching pair of boots. Her weapon of choice is leveled and randomly determined and can be either a mace, sword, or war axe. She carries random leveled bandit loot, as well as a small amount of gold. Once recruited into the Dawnguard, she dons a set of Dawnguard equipment, which includes armor, boots, gauntlets and a 75% chance of a helmet. She is equipped with a Dawnguard war axe, a crossbow, 24 steel bolts, and some gold. When you return from your brief venture to Volkihar Keep, you will find Isran battling a vampire in front of Fort Dawnguard. With his cover obviously blown, Isran will admit having underestimated the opposition: "If they're bold enough to attack us here, then this may be bigger than I thought. I have good men here, but... There are people I've met and worked with over the years. We need their skills, their talents, if we're going to survive this. If you can find them, we might have a chance." When asked where you should start looking for the much needed assistance, he will suggest Sorine: "We should keep it small. Too many people, and we'll draw unwanted attention to ourselves. I think we'll want Sorine Jurard. Breton girl, whip-smart and good with tinkering. Fascination with the Dwemer. Weapons in particular. Last I knew, she was out in the Reach, convinced she was about to find the biggest dwarven ruins yet." He thinks Sorine will be willing to help: "Might need a little convincing, but she should." This starts the quest A New Order. At this point, Sorine will emerge in the wilderness south of Mor Khazgur, busy studying a Dwemer Convector. When you get near her, it becomes clear that she has a problem: "What would mudcrabs want with my satchel, anyway?" and "Just one gyro. One, and I can get back to work. Where are they?" When you talk to her, she will ask: "You haven't seen a sack full of dwarven gyros lying around, have you? I'd swear I left it right here. Do you think mudcrabs might've taken it? I saw one the other day... Wouldn't be surprised if it followed me here." She will then plead: "Just look around, will you?" When you tell her that Isran sent you, she will respond: "Isran? Wants me? No, you must be mistaken. He made it exceedingly clear the last time we spoke that he had no interest in my help. I find it hard to believe he's changed his mind. He said some very hurtful things to me before I left. Anyway, I'm quite happy in my current pursuits. So if you'll excuse me..."
Before she returns to her missing satchel, you have two options; either ask her about her relations with Isran, or tell her about the vampire threat. The former will make her say: "Yes, that was my point. I felt it was rather clear. Look, what is it you want from me?" Alternatively, the truth about the vampires will reveal that she foretold it long ago: "Vampires? Really? Oh, and I suppose now he remembers that I proposed no less than three different scenarios that involved vampires overrunning the population. Well, what are they up to?" Once again, you have two options. When confronted with the fact that the vampires have an Elder Scroll, she will say: "I... Well, that's actually something I never would've anticipated. Interesting. I'm not sure what they would do with one, but in this case Isran is probably correct in thinking it isn't good." If you instead just tell her that Isran is concerned, she will respond: "In case you haven't noticed, Isran is always concerned about something. That's what got us working together in the first place. Still, if he sent you to find me, it may actually be pretty bad. All right. If nothing else, I suppose it wouldn't hurt to learn more about what's going on so I can better defend myself. But I'm not just going to abandon what I've been working on here. It's too useful. I need at least one intact dwarven gyro. So either I need to find the satchel those mudcrabs stole, or I need another gyro from someplace. You wouldn't happen to have one, would you?" At this point, Sorine can be persuaded. If you fail, she will say: "I'm sorry, I'm not about to do that without at least a single gyro to show for my efforts." If you succeed, she will be ready: "Fine, fine! I can't afford to forget about this work, though. Some very interesting applications. Now where is it I'm supposed to be going?" Instead of persuasion, and if you have a gyro, she will be ready right away: "Thank you! It's not much, but this will help a great deal with some things I've been researching. Now where is it Isran expects me to go?" If you don't have a gyro, she will instead utter: "Well then I'm very sorry, but I just can't walk away from this project yet." When you repeat that Isran needs her help, she will say: "I understand that, but I really can't leave here without at least one usable piece of dwarven equipment." Locate her satchel and bring her a gyro, and she will finally accept. When you tell her where she needs to go, she will respond: "Ah. Been working more on his secret hideout, has he? It'll be interesting to see how much progress he's made. I'll finish up here and head in that direction soon as I can. See you there." Gunmar: "All right Isran, you've got us all here. Now what do you want?" Isran: "Hold it right there." Sorine: "What are you doing?" Isran: "Making sure you're not vampires. Can't be too careful. So, welcome to Fort Dawnguard. I'm sure you've heard a bit of what we're up against. Powerful vampires, unlike anything we've seen before. And they have an Elder Scroll. If anyone is going to stand in their way, it's going to be us." Sorine: "This is all well and good, but do we actually know anything about what they're doing? What do we do now?" Isran: "We'll get to that. For now, get acquainted with the space. Sorine, you'll find room to start your tinkering on that crossbow design you've been working on. Gunmar, there's an area large enough for you to pen up some trolls, get them armored up and ready for use. In the meantime, we're going to get to the bottom of why a vampire showed up here looking for you. Let's go have a little chat with it, shall we?" Isran will then grant them both access to the rest of Fort Dawnguard, and the quest Prophet will begin. Sorine and Gunmar will slowly head into the western area where the rest of the Dawnguard reside. At this point, there will be no lab for Sorine and she will merely spend her entire day wandering around, at times working the available smelter or tanning rack. Like the other vampire hunters, she sleeps in the northern chamber where Isran has set up a few cots, although she may have to sit up all night long if they are all occupied. She enters the chamber at midnight and returns to her daily work at 8am. Once you reach stage 60 of the quest, her workspace will be extended with an alchemy lab, several soul gems, a blacksmith forge, and a table with iron ingots and a dwemer cog and gear. Sorine will obviously use the forge and alchemy lab for her research as well. When approached, she will comment: "Hope you're getting along with Isran. He takes some getting used to." When talked to, she will add: "Well, this isn't exactly a palace, is it? Still, it's sturdy, secure, and seems defensible. I suppose I'd rather be here than most other places in Skyrim. If Isran needs me, it must be pretty bad. I wonder what we're up against here." She will also say: "I like what Isran has done with the place. It's good to see someone else who's really prepared. ", "Very few people appreciate all the horrible things that can happen to you if you're not being cautious. ", "There are at least thirty different ways of being attacked and killed in your own home at any given moment." and "I think we have a better chance of surviving here, don't you?" Once you have initiated conversation, she will reveal herself as a master Archery trainer and will, when asked if she can make you better, accept with: "I can certainly try." She will also tell you about the old Dawnguard: "I've only heard stories. Not sure if any of them are true. Like that they were supposed to guard some vampire here, but wound up all becoming vampires themselves when they saw how powerful he was. And then preyed on the Rift until finally someone put them down. I guess it doesn't matter now. At least Isran is trying to do something noble with the name." Next, you can ask her if she can teach you how to make a crossbow: "A basic one? Of course. That is, assuming you know anything about steel smithing. It's pretty simple. Talk to Gunmar if you need materials." She will also start her own shop, selling general merchandise with the words: "I'll buy whatever you're looking to get rid of. ", "It's sort of a random assortment of things. See anything useful? ", "Here's everything I have. Sorry there isn't more." or "It's not easy to get supplies way out here, but I'm managing. Take a look." "Gunmar, do you think I could borrow a troll?" Sorine: "Why in the world did you ever try putting armor on trolls?" Sorine: "I mean, why would that idea even cross your mind?" Gunmar: "Oh. Well, I'm not sure. I guess it came from fighting them, thinking 'what could be worse?' And then realizing a troll with armor is even more intimidating." Sorine: "Well, that's certainly a line of thinking I can relate to." Gunmar: "How is the work coming along?" Sorine: "Fairly well, I'd say. I've managed to get this far without blowing myself up, I still have all my limbs..."
Gunmar: "What are you doing that's so dangerous?" Sorine: "Nothing. Well, not on purpose. But you never know. The strangest accidents can happen at any time. That's why I always try to be ready for anything." Sorine: "Gunmar, do you think I could borrow a troll?" Sorine: "Well I need to do some testing on this new weapon, and I was thinking a live target would be helpful." Gunmar: "Are you mad, woman? After the trouble I've gone through?" Sorine: "Fine. You could've just said 'no'." Sorine: "Have you talked to Isran?" Gunmar: "No. I try to avoid it. Always seems to end in an argument. You?" Sorine: "Why do you think I was asking?" "So, you think he's just crazy?" Sorine: "Do you think Florentius really talks to Arkay?" Gunmar: "I'm... not sure. I've never heard of the Divines speaking directly to someone before." Sorine: "So, you think he's just crazy?" Gunmar: "I didn't say that. I wondered if perhaps he did it for the attention, but every now and then he'll say something that makes me reconsider." Sorine: "I suppose we're all a little crazy to be here, right?" Besides her request for Florentius Baenius, Sorine will have a huge task for you. 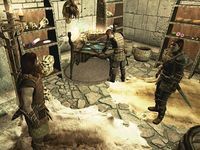 Most Dawnguard members will occasionally say: "Sorine needs help with her project to improve our crossbows." or simply: "Speak with Sorine. She has something for you." 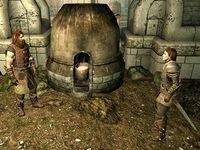 Speaking to Sorine starts Ancient Technology, a huge radiant quest where Sorine will send you to random locations all over Skyrim (and Solstheim if you installed Dragonborn) for various Dwemer schematics, six in all. 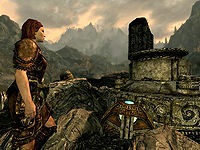 When you speak with Sorine for the first time and offer your help, it turns out she could use some special items in her attempt to mix her fascination with the Dwemer and the construction of stronger crossbows: "I want to add some punch to our crossbow capabilities, I've done all I can on my own. I need a little inspiration. I've always been fascinated with Dwemer artifacts. I take them apart, poke around in their guts, and try to figure things out - with mixed results. But as luck would have it, I've tracked down the location of some actual Dwemer diagram drawings! So, if you'd be a dear and collect those plans for me?" When you return with the Enhanced Crossbow Schematic, Sorine will take it off your hands with the words: "You're back and alive to boot! Fantastic. Hmmm... I see. Clever dwarves. With a similar technique and a little tinkering I should be able to improve the capabilities of our crossbows. I often wonder where we'd be if the Dwemer were still around. Ah well. We'll have to manage with the scraps we find." She will then say: "Here. Let me show you how it's made... Assuming you have the smithing skills, you should be able to make this yourself at Gunmar's forge. Either way, I'll have some for sale soon." She will now stock an enhanced crossbow in her store. The second time you offer Sorine your help, she will say: "I've got more leads on additional Dwemer plans. Those last ones helped me immensely. If you could collect this one for me, it's sure to result in extraordinary success!" When you return with the Dwemer Exploding Fire Bolt Schematic, a happy Sorine will tell you: "Ooh, good. I was just starting to get bored. Would you look at that. An exploding crossbow bolt. This should be fun!" She will then say: "Here. Let me show you how this works... I'll have some for sale soon." Sorine will now stock exploding steel bolts of fire. The third time, Sorine will accept your help with yet another task for a schematic: "Ready for more? I certainly am. Be a dear and fetch me another set of Dwemer diagrams?" When you return to her with the Dwemer Exploding Ice Bolt Schematic, she will comment: "Let's see what you've got there. I see... similar to the exploding bolt, only this one will cause damage with splintering shards of ice sharp as glass. Charming!" As always, she will continue with: "Here. Let me show you how it's made... Assuming you have the smithing skills, you should be able to make this yourself at Gunmar's forge. Either way, I'll have some for sale soon." Sorine will now sell exploding steel bolts of ice. When you offer to help her for the fourth time, she will once again change her dialogue: "It's amazing what I'm able to learn from studying these Dwemer plans. Want to head out there and collect some more?" When you hand her the Dwemer Exploding Shock Bolt Schematic, she will accept it and comment: "Back already? Can't wait. Let's see... Ooh! This diagram explains how to fashion a bolt that will send a jolt of shock through whatever it hits. Testing this will require some extra precautions, I think. Here. Let me show you how it's made... Assuming you have the smithing skills, you should be able to make this yourself at Gunmar's forge. Either way, I'll have some for sale soon." Sorine will now sell exploding steel bolts of shock. When offered help for the fifth time, Sorine will start to ironize: "I'm starting to think you like this as much as I do! 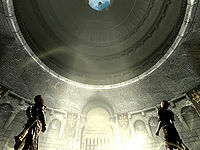 Here's the location of the next set of Dwemer diagrams. Thanks!" This time you will find the Dwarven Crossbow Schematic and Sorine will be happy to receive it: "You never disappoint. What've you got there? Is it really... it is! I was hoping we'd find this. It's a diagram for a dwemer crossbow. Much more sophisticated, and powerful, than the ones we use. Here. Let me show you how this works... I'll have some for sale soon." She will now stock a dwarven crossbow in her store. The sixth time you offer to help her out, she will claim that this is the big one: "Alright! One more set of dwemer plans to go. Think I'll be sad when we're done collecting these. Who knows though, maybe more plans will turn up in the future. But I can't wait to see these drawings. Go on, get out of here!" When you finally return with the Enhanced Dwarven Crossbow Schematic, Sorine will be overwhelmed with joy: "Now this is a find! Plans for improving the Dwemer crossbow. This should add some extra punch to an already devastating weapon. Here. Let me show you how it's made... Assuming you have the smithing skills, you should be able to make this yourself at Gunmar's forge. Either way, I'll have some for sale soon." As a result of this last assignment, Sorine will now sell you a enhanced dwarven crossbow. From this point, she will only point you towards other Dawnguard members for jobs and the Ancient Technology quest will be over once and for all. When it is time to confront Lord Harkon during the quest Kindred Judgement, Sorine will listen to Isran's speech in the main hall along with the other Dawnguard members. When Isran gives the order, she will travel halfway across Skyrim to Castle Volkihar and will participate in the joint effort to kill all residing vampires, while shouting: "Give him a crossbow bolt between the eyes for me!" When all is said and done, she will sheathe her weapon and walk all the way back to Fort Dawnguard and live there indefinitely with the other members. Bolstering the Ranks: Find Florentius Baenius and recruit him into the Dawnguard. Kindred Judgment: Confront Lord Harkon. A New Order: Recruit Isran's old allies for the Dawnguard. Destroying the Dawnguard: Kill the Dawnguard leaders. Her store may not update with the new Dwarven items after you do the Ancient Technology quests. She may only gain new steel bolts in her store. Sometimes after finishing Ancient Technology, she will not give you any more quests. ? One fix is to reload a previous save before you took the quest. A workaround for obtaining the missing recipes is available, for PC users only, in the quest page. This page was last modified on 22 June 2018, at 04:57.